Claire Gu, professor of electrical engineering at the University of California, Santa Cruz, has been elected a Fellow of the International Society for Optical Engineering (SPIE). Gu is among 56 new Fellows honored by the society this year as members of distinction who have made significant scientific and technical contributions in the fields of optics, photonics, and imaging. "The annual recognition of Fellows provides an opportunity for us to acknowledge outstanding members for their service to the general optics community," said SPIE president Brian Culshaw. Gu was honored for specific achievements in information photonics. She has been working in this area for 20 years, exploring the materials, phenomena, and applications of optics and working to develop photonic devices and systems for the next generation of information technology. She is currently focusing on optical trapping and sensors for chemical, biological, and environmental detection. 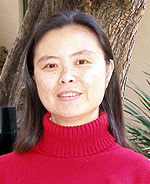 Her research interests also include volume holographic data storage, optical fiber communications, nonlinear optics, liquid crystal displays, and optical information processing. The author of more than 180 journal and conference papers, Gu has also published nine book chapters, coauthored a reference book, Optics of Liquid Crystal Displays, and coedited two technical books on photorefractive nonlinear optics and applications. She served as a topical editor of Optics Letters from 2000 to 2006 and has been a reviewer for numerous journals in the fields of optics and applied physics. Gu earned her B.S. from Fudan University in Shanghai, China, and her Ph.D. from the California Institute of Technology. Before joining the UCSC faculty in 1997, she was a member of the technical staff at Rockwell Science Center in Thousand Oaks, California, and an assistant professor of electrical engineering at Pennsylvania State University.